The department consists of 2 bedrooms, 2.5 bathrooms, fully equipped kitchen, dining room, satellite TV, DVD, laundry room and terrace with views to the huge pool and the Caribbean Sea. The main bedroom has pool views and beautiful custom-built furniture, a King Size bed, a closet, a safe and a private bathroom. The second bedroom has 2 queen Size beds, a closet and a private bathroom. The kitchen is fully equipped and provided with a dining room for 6 people and a very comfortable living room with satellite TV, DVD, a guest bathroom and a laundry room. The terrace consists of a breakfast bar for 6 people, 2 lounge chairs and a magnificent view to the condominium pool and the Caribbean Sea. Wonderful family vacations, the condo are well located and beautiful ocean view, I strongly recommend this place. First time in Playa. We generally prefer to rent a condo and explore the area rather than stay at an all-inclusive. My family (two adults, three teenagers) spent 4 nights in PlayaCar at this Elements Condo. It was perfect for us. The property manager was responsive and attentive before, during and at the end of the stay. The condo itself is just north of the main strip so it was pretty quiet but an easy 10 minute walk to the start of the bustling 5th Avenue. Large floor to ceiling windows and two large balconies overlooking the pool and the beach. A modern and tastefully decorated two bedroom condo. The pool is great and just across the street is the beach and an area on the beach with at least 70 lounge chairs and umbrellas reserved for Elements guests patrons. So you could easily choose between and go up and back from the pool to the beach to enjoy the sun. I would definitely stay there again (or at any other condo in this complex). 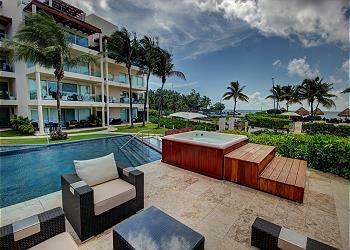 Elements 122 is a wonderful place to stay and relax on Playa del Carmen. Hosts Evelyn and Rangel from Playa Moments are obliging and helpful, and accommodation includes for a good rate pickup and drop off from/to the airport. The gardens are beautifully maintained and our children loved the pool. Private Beach Club is a bonus. Balcony is great, and we also had a jacuzzi to enjoy the view. The unit is clean and well-maintained. Look out for the sea turtles swimming just down the road to Tulum at Akumal Beach! We stayed in a two bedroom family unit with our two children and there was plenty of room - two bathrooms, too - a bonus. Overall, a great stay! The positives; Playa Moments Anuar and Luna were great, very responsive and helpful. The location was good. Close to the beach and walking distance to many fantastic restaurants. Beach club area is nice, beach is swimmable but some days smelled bad from the seaweed? Massages at beach club were wonderful. The negatives; The dishwasher was dead upon arrival and out of commission for our stay. We had to request a pot and pan even though there was a full kitchen. Strange. The hot tub at Elements only worked for 2 of the 8 days. Many of the glass tiles around the pool are cracked and broken. 2 of my teens stepped on the tiles and got glass in their feet while using the pool.